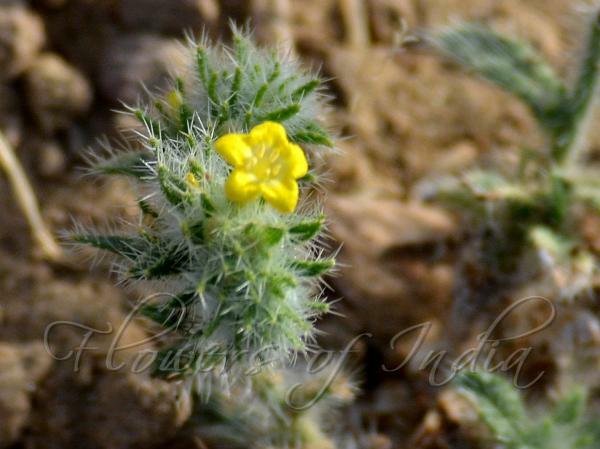 Arabian Primrose is an annual herb up to 40 cm tall, erect or ascending, much branched from the base, with strong red roots, densely covered with white bristles. Leaves are alternate, simple, without stipules, stalkless; blade linear-lanceshaped, 1.58 cm x 0.2-1 cm, tip pointed to blunt, margin entire. Inflorescence spike-like, consisting of at branch-ends, short and dense scorpioid cymes, simple or forked; bracts leaf-like. Flowers are stalkless, bisexual, regular, 5-merous; calyx deeply divided, sepals 5-8 mm long, unequal, hardly accrescent in fruit. Flower are tubular, 8-16 mm long, yellow, tube hairy inside, petals small; stamens inserted at about the middle of the flower tube, filaments about 0.5 mm long, anthers 1.5 mm; ovary superior, 4-lobed, style about 1 cm long, 2-lobed, each lobe ending in a kidney-shaped stigma. Fruit consists of 4 pyramidal nutlets up to 2 mm long, ventrally keeled, granulose to smooth, grey to yellow-brown. 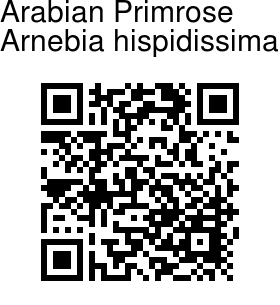 Arabian Primrose is found in tropical Africa, Egypt, to India. Identification credit: Priyanka Salunkhe Photographed in Barmer, Rajasthan.